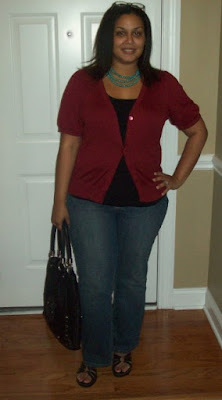 Here is another **fun** cardi -tee combo LOL. cute, cute outfit. i love the jeans and necklace. please tell me which jeans are these? are they still available? Thank you! The jeans are their 5 pocket bootcut jeans - If you like the shape, they still have them, but not in the particlar wash I am wearing. They are item C31911, and still full price in the other 2 colors (boo) LOL! Now, if you go into an actual store, you may be able to still find them on a clearance rack, I have run into a few pairs here and there. The color is the "Premium Indigo Wash". bianca-thanks so much for the info. I love the wash and fit of these jeans. I will check out the website and stores for a pair. I love them on you. Very cute outfit and great look on you! I love the pop of turquoise in the necklace! Sheila - you have such a fun blog - thanks for posting here!